Sometimes a standard height toilet just isn’t high enough. 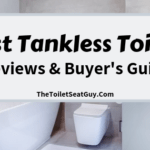 If you are looking for a taller toilet then this article on the Best Comfort Height Toilet Reviews will be a great help. Comfort Height toilets are specially made for people that need a taller toilet seat. A Comfort Height toilet is not only ideal for tall people, but they are also very beneficial for anyone that finds it difficult to use a standard toilet. The elderly, disabled and people recovering from surgery will all benefit from a taller toilet seat. 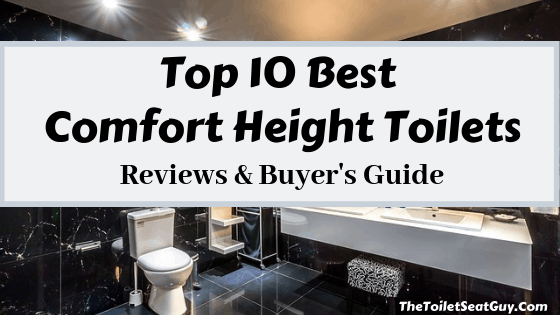 In this article, I have chosen 10 of the best Comfort Height toilets on the market today. They all measure over 17″ in height and they are all powerful, water efficient and look great. Lets have a closer look to see which Comfort Height toilets made the list. The Kohler Cimmaron toilet is a highly rated water efficient, comfort height model that would be a great addition to many bathrooms. It has a neat design that isn’t too high profile, however it has an elongated bowl so may not be the most suitable for small bathrooms. Lets have a look at the design. The Kohler Cimarron is a two-piece toilet and will arrive in two separate parts. Two-piece toilets are generally cheaper than one-piece toilets, however they do tend to accumulate more dirt in crevices, meaning more cleaning and maintenance is needed. This toilet is a Comfort Height toilet and measures roughly 17.6″ from floor to seat. This toilet will be over 2″ higher than a standard toilet, making it a good choice for tall adults. It is also a good choice for people that find it difficult to stand up or sit down, such as the elderly, disabled or people recovering from surgery. The Cimarron may be a little uncomfortable for short people and young children because it might be a little high. Also, it is has an elongated shape, which provides more space to sit on. An elongated toilet is roughly 2″ larger than a round bowl, so it will take up more space in a small bathroom. However, an elongated bowl will be more comfortable for the larger individual. The Kohler Cimarron is a WaterSense certified toilet that uses 1.28 gallons per flush (GPF). A 1.28 GPF toilet will give you 20% water savings compared to a 1.6 GPF toilet. If you are upgrading from an older standard model that uses 3.5 GPF, then the Kohler Cimarron will make a huge difference. A WaterSense certified toilet is not only great for the environment but also makes a big difference to your water bills, in the long term. The Kohler Cimarron uses AquaPiston Technology to give a powerful 360° flush around the bowl and rim. This toilet may only use 1.28 GPF but it has a nice bit of power in the flush. The Kohler Cimarron uses a DryLock Fast Install System that allows you to assemble the tank and bowl with ease. Two piece toilets have a tendency to leak a little, however with the DryLock system it really does make a difference and should prevent any leaking issues. 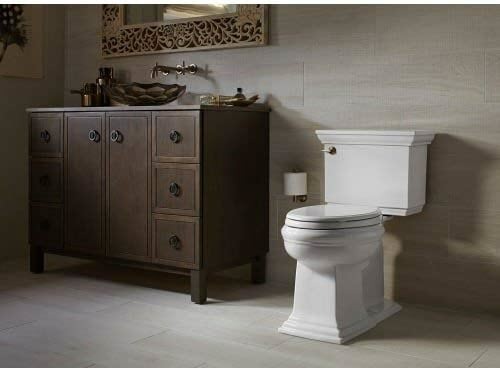 This Kohler Cimarron is a highly rated, neat, water efficient toilet that has a powerful flush. Of course, it is a Comfort Height toilet, making it suitable for many people. If you would like to read a more detailed review on this toilet, then follow the link. The TOTO Drake II is a very popular model among households and it is easy to see why. It looks great, is very water efficient, uses a powerful flushing system and has Universal Height seating. Lets have a look at these features in more detail. The Drake II has a high profile design of 30″, from floor to the top of the tank. Also, it is a two-piece toilet with an elongated bowl, making it suitable for larger individuals that need a little more seating space compared to a round bowl. This unit is a Universal Height toilet. The Universal Height is TOTO’s version of Comfort Height. A Universal Height toilet needs to measure between 17″ and 18″. The Drake II measures 17.25″, giving it a decent height and is ideal for tall people. If you are recovering from knee surgery or find it difficult to use a standard toilet, then a Universal Height toilet is a great choice. It is similar in height to a standard kitchen chair. The Drake II is a highly efficient toilet, using only 1.0 gallon per flush. This compares very well to any toilet. In fact, it might be the minimum flush for a single flush toilet (the Niagara below, only uses 0.8 GPF). Dual flush toilets may have less flush for a low volume flush, however, their high volume flush is usually the same as 1.0 GPF or more. Of course, this toilet is WaterSense certified, making it ideal for not only environmental conservation but also great for savings on water bills. The Drake II uses its Tornado Flushing System to provide a powerful flush with the minimum use of water. The Tornado Flush features two powerful nozzles that produce a cyclonic rinsing action. This rinsing action will reduce waste buildup and helps keep the bowl cleaner. Finally, TOTO’s patented CEFIONTECT®ceramic glaze finish not only creates an extremely smooth surface but also prevents debris and mould buildup and will keep the bowl cleaner for longer. 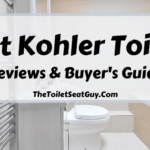 One reviewer on Amazon that has experience installing different toilet brands found the Kohler brand the easiest to install. He found it the most ‘out of the box’ installation friendly toilet. The reason for this is that TOTO required more work connecting the tank to the bowl, whereas the Kohler is very easy to connect. (Check out the Kohler Cimarron’s DryLock Fast Install System above). The TOTO Drake II is an excellent toilet with a powerful flush and great water efficiency. Only using 1.0 GPF will make it hard to beat. With its Universal Height seating of 17.25″ from floor to seat, it is a great choice for many people. If you would like a more detailed review on the TOTO Drake II, then follow the link. The Kohler Santa Rosa is a pretty, one-piece toilet with a smooth and sleek design. This toilet is rather compact and not the tallest. It may be relatively short from floor to tank, however it is still a Comfort Height toilet and ADA Compliant. The Santa Rosa is the first one-piece toilet to make it on to our list. If you are considering a one-piece toilet for your bathroom, it is worth knowing some of the pros and cons of a one-piece. Firstly, the positives. A one-piece toilet is easier to clean and maintain. Obviously, a one-piece toilet has only one part. This means you do not have to connect the base to the tank when installing. Another advantage is that it is easier to clean because there are no crevices for dirt to accumulate. Dirt, bacteria and mold love growing in the little gap between a tank and bowl, so a two-piece needs regular maintenance to keep it clean. However, a one-piece will only need a wipe every now and again to keep it looking as good as new. There are negatives to buying a one-piece also. They are more expensive than a two-piece. They are also heavier than two-piece toilets and because of this, will take a little bit more effort to install. 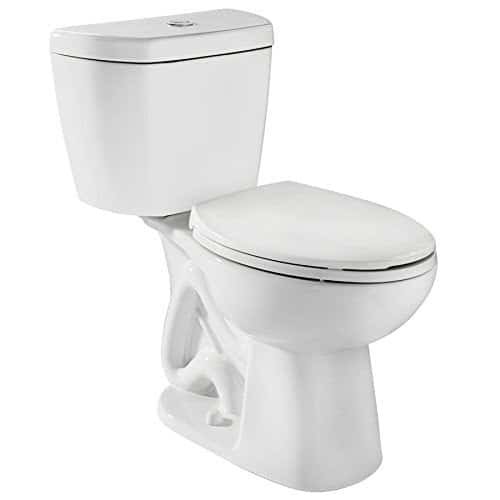 The Santa Rosa is a Comfort Height toilet and measures 16 1/2 inches from floor to rim. With a seat installed the measurement will reach around 17 1/2 inches and will be perfect for tall people. Of course, the Santa Rosa is ADA Compliant and will be a great toilet for the elderly, disabled and people struggling to use a standard toilet. 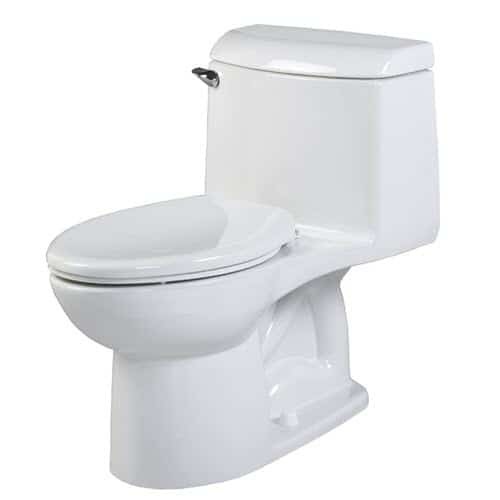 Not only is the Santa Rosa a great Comfort Height toilet but it is also very water efficient. It is WaterSense certified and only uses 1.28 gallons per flush. If you are interested in conserving water, not only for the environment but also for saving money, then this model is a great choice. This model will use 20% less water compared to a 1.6 GPF toilet and also save 16,500 gallons of water per year compared to a standard 3.5 GPF toilet. The Santa Rosa uses the AquaPiston flushing system to provide a powerful 360° flush that will clean the entire bowl. When it comes to flushing, this model is both powerful and efficient. As stated earlier, the Kohler Santa Rosa is a one-piece toilet. One-piece toilets weigh around 100 lbs, so are not light. I believe that most people should be able to install their own toilets because it is not that difficult a task. However, it is also worth remembering that this model will need to be lifted into place, so you have to make sure your back is up to the task. In the Santa Rosa full review page, you can see a video demonstration of a Santa Rosa installation. After watching the video, you should be able to decide on whether you can install it yourself or not. 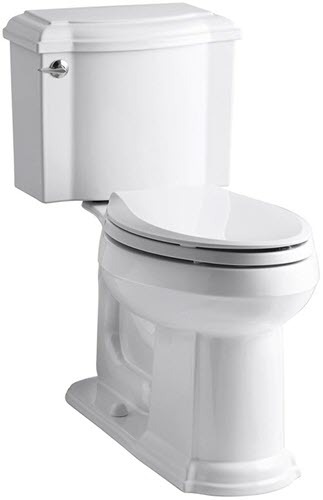 Overall, the Kohler Santa Rosa is a great looking one-piece toilet. It has Comfort Height seating, making it suitable for a wide range of users. It is also WaterSense certified and eco-friendly. With a powerful and efficient flush and Comfort Height, this attractive one-piece toilet is certainly worth considering. The Kohler Memoirs Stately will bring you some regal style for your bathroom. This toilet is both stylish and unique. I’m sure there are not many toilets in modern households that have a classic look like the Memoirs Stately. 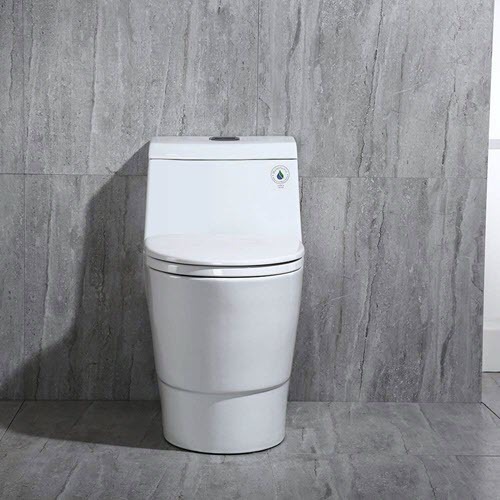 The Memoirs Stately model is one of the most attractive toilets on our list. It has a solid square base with a nice design at the bottom. This also matches the square tank, with its sharp edges and extra wide lid. In fact, the lid looks like a crown on top of this royalty worthy toilet. Of course, this model has to be supremely comfortable also. It is a Comfort Height toilet and will measure over 17″ in height, when a toilet seat is installed. A Comfort Height toilet is ADA Compliant, so it is suitable for a wide range of users. This toilet seat height will be comparable to a standard size kitchen chair. If you find it difficult or uncomfortable using standard size toilets, then this height will suit you much better. It is also worth noting that if you have young children, a Comfort Height toilet may be too high for them and will make using the toilet a little bit more uncomfortable. Speaking of comfort, this model is an elongated toilet. An elongated toilet bowl is around 2″ longer than a round bowl. This will give the user more space to sit on. Most people prefer elongated toilets these days because they are more spacious. They are also longer in general, so make sure you have enough space in your bathroom for a larger toilet. Just like many other Kohler models, this unit uses the AquaPiston flushing system. Using the AquaPiston Canister, this toilet has a powerful flush that will reach 360° of the bowl each and every flush. The AquaPiston canister also has 90% less seal material exposed compared to a 3″ flapper, providing a leak-free performance. This is a good feature because the Memoirs stately is a two-piece toilet which are more prone to leaking compared to a one-piece. You shouldn’t have to worry about leaking toilets anymore because Kohler are ahead of the game. This model is WaterSense certified and only uses 1.28 GPF. The Memoirs Stately is a two-piece toilet and will come in two separate parts. All you will have to do is connect the base to the flange and then connect the tank to the base. It will be lighter and easier on your back because you don’t have to lift a heavy one-piece model. Sounds too easy? Well if you are unsure whether you can install this toilet yourself, then why not have a look at a Kohler toilet installation demonstration. There is a short video just waiting in the full review. Overall, I love the look of this model and I am sure most people will. It is such a classy looking toilet and will add a lot of style to any bathroom. It has Comfort Height seating, is WaterSense certified and has a powerful flush. What more could you ask for in a toilet. Choosing a toilet is a very personal thing. Many of these toilets will have similar features and have identical performances. At the end of the day, your decision will come down to a personal choice. The Kohler Devonshire is quite a popular model and should definitely be on your list. When it comes to design, the Devonshire is certainly an attractive model. If I was comparing it to a similar model, it would be the Memoirs Stately above. They both have a classic, elegant look and are very stylish. However, the Devonshire is a little smoother compared to the Memoirs collection. The edges are not as sharp. This model is of course a Comfort Height toilet and ADA Compliant. If you have read any of the other reviews, you will by now know the benefits of a Comfort Height toilet. It will be taller than a standard toilet and ideal for tall people, seniors, people with disabilities and generally anyone that finds it difficult to stand up or sit down. The Devonshire is a two-piece toilet and elongated in shape. 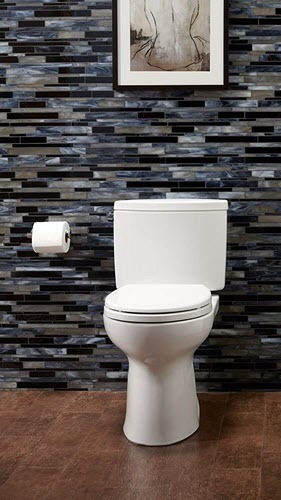 An elongated toilet is roughly 2″ longer than a round bowl and will be more comfortable and spacious. 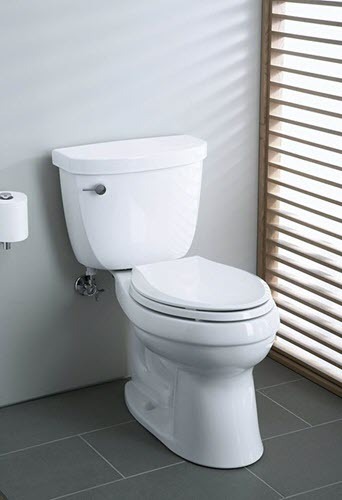 Elongated toilets are not ideal for tiny bathrooms because they are usually not as compact as a round bowl toilet. The Devonshire uses AquaPiston technology to provide a powerful and very efficient flush. It will provide a 360° flush that will reach the entire bowl and give it a thorough cleaning. Like other Kohler models in these comfort height toilet reviews, the Devonshire consumes only 1.28 GPF. This is 20% less than a 1.6 GPF toilet and compared to an old standard toilet that uses 3.5 GPF, then you can make some serious savings. In fact, if you are upgrading from an old toilet, you will save up to 16,500 gallons of water per year. As with most other modern toilets, there should be no great difficulty in installing this model. It is a two-piece toilet, so you will connect the base to the flange and then the tank to the base. In fact, Kohler have made the latter part even easier now with their 3 bolt locking system. The 3 bolt locking system has not only made it easier to connect the tank to the bowl but has also made it a better connection. Check out the installation video on the full review page. Overall, the Devonshire is a very attractive model with a classic, elegant look. It is also both powerful and efficient and of course has Comfort Height seating. If you like the look of this model, then why not check out its full review so you can see some images, videos and the current price. One of TOTO’s most popular toilets, the Ultramax II is an easy one to choose. If you are looking for a one-piece toilet, then this model should definitely be considered. It is simple, sleek and modern, and with TOTO’s best technology, you are guaranteed a high quality toilet. A bonus with this toilet is that a SoftClose toilet seat is included, so you don’t have to bother looking for one yourself. These SoftClose toilet seats are awesome, especially if you have small children. No more pinching of fingers or loud banging noises. When I first looked at this toilet, I noticed that it is quite similar to the Kohler Santa Rosa above. If you like the style of this model, then maybe it would be a good idea to compare both. Kohler and TOTO are two of the best brands in the business, so it will be hard to choose between the two. The Ultramax II is a one-piece toilet, that will be easier to clean and maintain. You won’t have to worry about finding dirt and bacteria growing between the tank and bowl. Just a quick wipe with a damp cloth every now and again is enough for a one-piece. One-piece toilets are heavier so make sure you are strong enough to lift it, if you want to install it yourself. Another positive thing about one-piece toilets is that they don’t tend to leak. No gaps between the tank and bowl, so no worries. However, one-piece toilets are more expensive and the Ultramax II will be no different. If you want to buy a one-piece, then expect to pay one or two hundred dollars more than a two-piece. The Ultramax II uses TOTO’s Double Max Cyclone System and is very powerful. As the name hints at, the flush is like a cyclone in the bowl. Swirling with power and pulling waste out. Make sure to look at the flush demonstration video in the full page review. The Ultramax II is also WaterSense certified using only 1.28 GPF. Like the other toilets in this article, you can make some serious water savings with this model. It will not only be great for your wallet but also great for the environment. To top it off, the bowl has a CEFIONTECT glaze finish that stops particles and debris from sticking to the bowl. This glaze finish will do its best to stop any marks from staying on the bowl after every flush. Nothing looks better in the bathroom than a shiny, sparkling toilet bowl. As I said in the Santa Rosa review, one piece toilets will be heavier to install. However, if you can lift 100 lbs, then there should be no problem in you installing this toilet yourself. There are many tutorials on YouTube which will guide you through the process. In fact, there are many videos showing you how, on this website. Overall, the Ultramax II is a top quality toilet that easily fits on this list. It looks great, has a very powerful flush, is highly efficient, great at staying clean and is very comfortable. Oh, and a SoftClose toilet seat is included. What more could you ask for. 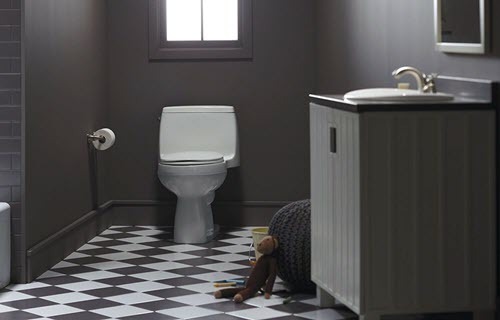 If you are looking for a one-piece toilet, then have a closer look at the TOTO Ultramax II. This Convenient Height extra tall toilet is the perfect choice for people that really have trouble standing up and sitting down. This brand isn’t as well known as the likes of TOTO, Kohler or American Standard, however there are some positive reactions to this toilet. Lets have a closer look to see if this toilet is worth considering. This Convenient Height toilet is specifically design for people needing an extra tall toilet. Unlike, Kohler’s Comfort Height toilets or TOTO’s Universal Height toilets that are 2″ taller than standard toilets, this model is a whole 5″ taller. This toilet is TALL. In fact, this measurement is only from floor to rim. With the seat installed,it actually measures 21″. This toilet is perfect for people with dodgy knees or for people that have had some major surgery. It really makes using a toilet a lot easier. The tank is very slimline and although this model is elongated, it is still quite compact and should be suitable for most bathrooms. This toilet is WaterSense certified and a great water saver. It is a dual flush toilet using only 1.28 GPF for solid waste and only 0.9 GPF for liquid waste. Either of these flushes will save you a lot of water even compared to a modern 1.6 GPF toilet. The extra height of this toilet also adds to the effectiveness of the flush. The extra height allows gravity to provide extra power and speed to the flush. According to customer reviews, the flush is pretty good. Normally I would advise you to install your toilet yourself, however this company are stating that you must have a licensed plumber install this toilet. Overall, the 20″ Convenient Height toilet looks awesome and will be ideal for people looking for a really tall toilet. This model will be great for anyone that finds it difficult standing up and sitting down. The dual flush is great and with a water usage of 1.28 GPF and 0.9 GPF, it is highly efficient. This toilet may not be made by one of the big guns, however it does seem like a nice option. The Woodbridge Dual Flush Comfort Height Toilet is a sleek, modern toilet that will be a perfect fit for a stylish bathroom. 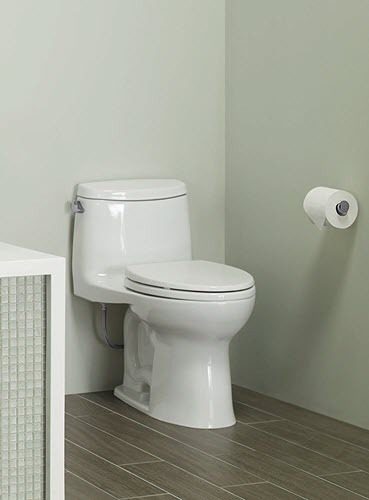 This one-piece toilet will not only be easy to clean and maintain, but its compact size and contemporary style will look great for years to come. Some toilets look traditional and some look modern. Well this toilet by Woodbridge definitely falls into the modern category. This toilet oozes luxury. I love the small tank and compact look of this model. It may be compact, however it is still a Comfort height toilet. With seat installed, this toilet should measure roughly 17 1/2″ from floor to seat. The seat is included with this model and it is solid and sturdy. It is also a SlowClose seat which will add to its high end appearance. This model is ADA Compliant and will be suitable for a wide range of ages and sizes. A Comfort Height seat will be similar in height to a standard kitchen chair, so you should get an idea how comfortable it will be for you. As you can see in the image, this model is very smooth. Many toilets have intricate designs along the skirted area, however these toilets can accumulate dirt easily. You won’t have that issue with this model because it is very sleek and smooth. Just a wipe with a damp cloth will keep it looking as good as new for years to come. If you are looking for a powerful, quiet and highly efficient toilet, then this model may be the one. Amazon customers appear to be very happy with its flush and performance and it is getting a lot of five star ratings. A glazed finish is also a nice feature for keeping the bowl clean. Of course, this is a dual flush toilet, allowing you to choose between a full and half flush. The full flush is 1.6 GPF and the half flush is 1.0 GPF. Now, because it averages to 1.28 GPF, this toilet is WaterSense certified and may qualify for rebates in certain states. As this toilet averages 1.28 GPF, it will use 20% less water compared to a single flush 1.6 GPF model. It will also use 16,500 less gallons of water per year, compared to a standard 3.5 GPF toilet. What I really like about this model is that Woodbridge supply all that is needed to install this toilet fully. They even supply a wrench to tighten the bolts. This model is a one-piece, therefore it will be quite heavy (over 100 lbs). However, if lifting a 100 lbs toilet into place is not a problem, then you should be able to install it yourself. Many customers say it is easy to install and it does come with instructions. Overall, the Woodbridge Dual Flush Comfort Height Toilet is a high-end, stylish and modern toilet that will look fabulous in most bathrooms. It is Comfort Height and suitable for most people, especially people that find it hard to use standard size toilets. Its dual flush mechanism allows you to conserve water and is WaterSense certified. If you are looking for a high-end, one-piece, modern toilet, then I highly recommend this model. The Champion 4 Right Height toilet appears to be American Standard’s most popular model. It is a one-piece, Comfort Height toilet, looks sleek and is quite powerful. How does the American Standard compare to other big brands like TOTO and Kohler. Lets see. This one-piece design looks similar to the Kohler Santa Rosa and the TOTO Ultramax II (both reviewed above). They are all one-piece models but also have a similar style. If you like the look of this model, then make sure to compare it to the other two also. The Champion 4 will be quite easy to maintain and clean. It won’t have a crevice between the tank and bowl to grow bacteria and mold. Therefore, a wipe with a damp cloth should do the job in keeping this toilet clean. This unit is a ‘Right Height’ toilet and is ADA Compliant. 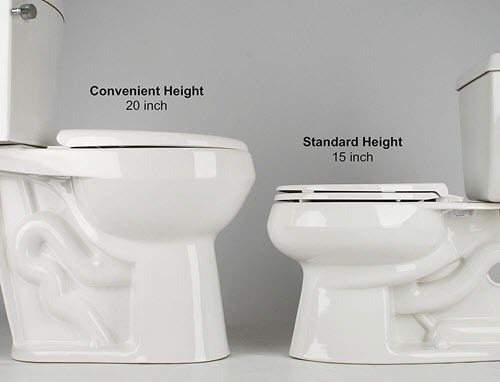 A Right Height toilet is the same as a Universal Height, Comfort Height and Convenient Height. They are just names given by the different brands and will have similar measurements. This Right Height toilet will measure over 17″ with a seat installed and will be a good choice for the elderly, disabled and tall people. It is worth noting that a toilet seat will not be included with this model. An Amazon customer gave a one, two and five year follow up review on the Champion 4. The reviewer stated that he never once needed a plunger for this toilet and he is extremely happy with it. That is a pretty glowing report on this model’s performance. This is not surprising when you read that this toilet can flush a mass that is 70% larger than the industry standard. The Champion 4 has also received the highest rating of 1,000 grams by an independent Maximum Performance (MaP) test. Also, you may have heard about the bucket of golf balls test. Well, American Standard have tried it and the Champion 4 passed that test with flying colors. This toilet is powerful! It makes sense when you know that this toilet’s flush valve is twice the size of a standard flush valve, at 4″. This 4″ flush valve will push water into the bowl three times faster than the standard 2″ flush valve. Its 2 3/8 inch siphon trapway is also large and will move 70% more waste compared to a 2″ trapway. Add to this the EverClean glaze surface and you not only have a super powerful flushing system but you will also have a sparkling surface for years to come. This model uses 1.6 GPF, therefore it is not WaterSense certified. As already stated in previous reviews, one-piece toilets are heavy. The advantage of a two-piece toilet is that it comes in two separate parts and will be installed separately. This is easier for lifting. However, if you are strong enough to lift a toilet of over 100 lbs into place, then you should be able to install this toilet yourself. Overall, the American Standard Champion 4 Right Height toilet is a sleek, powerful and durable toilet that has been thoroughly tested. It is a 1.6 GPF toilet so is not WaterSense certified, however it is ADA Compliant and is suitable for a wide range of users. If you are looking for a powerful flush that will be clog free for several years, then the Champion 4 by American Standard will be hard to beat. The Niagara Stealth is a nice, simple toilet, however what made it stand out for me is its supreme efficiency and affordable price. Niagara appear to be ahead of the game when it comes to water efficiency. Not only does this toilet perform well but it also quite tall, so it is a very good choice for comfort. Lets have a closer look. The Niagara Stealth is a nice looking toilet, quite simple in design, but still an attractive two-piece. It has a single flush button on top of the tank. Its bowl is elongated with quite a strong trapway design on the side of the skirt. This will take an extra bit of cleaning compared to a smooth skirt, however this shouldn’t be a deal breaker. Many modern toilets have this same design. A real positive with this model is how tall the seat is. From floor to rim, this model measures 17″. That is pretty high and taller than most. With a toilet seat attached, this unit should measure 18″ or over. This toilet height will be great for tall people. Also, of course this toilet is Comfort Height and ADA Compliant. The toilet seat will not be included with this toilet. What makes this toilet stand out compared to other toilets is how efficient it is. Niagara will be hard to beat for water efficiency. It is a single flush toilet that uses only 0.8 GPF. This is amazing and according to many positive reviews, this low amount of water does not effect the quality of the flush. You will only need one flush to clear waste, so no double flushes here. The Niagara Stealth easily passes WaterSense guidelines, so you should be able to get water rebates if you qualify. This toilet is also a pressure assisted, however it is very quiet when flushing. As with most two-piece toilets, this model should be easy to install. Having two separate parts makes the whole process that bit easier and lighter on your back. If you need some inspiration before installing it yourself, there are many different videos on YouTube to guide you through installation. Overall, the Niagara Stealth Comfort height toilet is a great toilet at an affordable price. It is probably the cheapest model in this review, so it will be great for those on a budget. It is not only the cheapest but also the most water efficient. A one flush of 0.8 GPF will be hard to beat and it is powerful and quiet also. Most standard toilets measure between 14″ and 15″ from floor to rim. This height can be fine for many people, however it may be a little short for some. A Comfort Height toilet will measure over 17″ from floor to seat and usually measures between 17″ and 19″. You may also see a Comfort Height toilet being called a Universal Height toilet or a Right Height toilet or even a Convenient Height toilet. They are all the same and it is just a name given by a specific brand. As said earlier, a standard height toilet will be fine for many people and ideal for shorter people and children. However, some people will find a standard height toilet uncomfortable. Tall people will find a tall toilet more comfortable and easier to use. However, Comfort Height toilets are not only for tall people. The elderly will benefit greatly from a Comfort Height toilet. As we age, it becomes more difficult to stand up and sit down. Our muscles atrophy with age and our joints become inflamed and painful. As arthritis sets into our knees and hips, sitting down becomes a chore. The lower the seat, the harder it becomes, however the higher the seat, the easier it is. A Comfort Height toilet can be a great help for seniors that find it hard to use a standard toilet. Using a toilet is a daily occurrence, so it is important to make it as comfortable as possible. People with disabilities can also find a Comfort Height toilet very useful. A standard height toilet can be too low for some disabled people, so a taller toilet seat can help. The less assistance a disabled person needs when using the toilet, the happier they will be. Also, if you are recovering from surgery, a Comfort Height toilet can really help your recovery. If you have are having surgery on your hips or knees, then standing up and sitting down will not only be painful but it can also lengthen your recovery time. Rest is best for recovery, so having to squat down too much may not be the best option. A toilet that is a little higher may be a lot more comfortable during the recovery process. Of course, a Comfort Height toilets will be taller than a standard toilet and will normally measure between 17″ and 19″. However, you will often see the measurements from floor to rim. Many of the Kohler and TOTO toilets will only measure 16 1/2″ from floor to rim, however with the seat installed, they will measure around 17 1/2″. A Comfort Height toilet is a great choice of toilet for not only tall people but anyone that finds it difficult to use a standard height toilet. Seniors, disabled, surgery patients can all benefit from a Comfort Height toilet. A Comfort Height toilet will have all the features of a regular toilet and should be similar in price. I hope you found this article on the Best Comfort Height Toilet Reviews helpful. There should be one in this list that will be ideal for your bathroom. If you have tried any of these models in the review, let us know in the comment section below. I would love to know if a Comfort Height toilet benefited you.